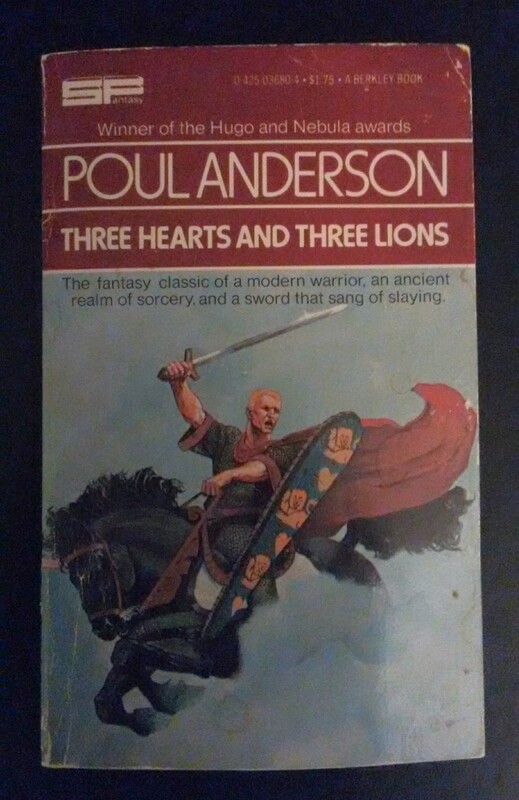 I picked up Poul Anderson’s Three Hearts and Three Lions for 77 cents on Amazon, this is something I’ve been meaning to read for a while. Charisma scores of 17 or greater by fighters indicate the possibility of paladin status IF THEY ARE LAWFUL from the commencement of play for that character. If such fighters elect to they can then become paladins, always doing lawful deeds, for any chaotic act will immediately revoke the status of paladin, and it can never be regained. The paladin has a number of very powerful aids in his continual seeking for good: He can “lay on his hands” to cure wounds or diseases in others (two points of damage for every level the paladin has attained, one disease per five levels, either function per-formable but one per day). Paladins are not themselves subject to disease. They have a 10% higher saving throw against all forms of attack (excluding melee). Paladins of 8th level and above dispel evil (spells, undead, evil enchanted monsters, and the like) simply by ordering it hence, and they detect all evil at a range of 6″. Paladins with any form of “Holy Sword” are virtually immune to all magic (see MONSTERS & TREASURE, MAGIC & TREASURE, Swords). The paladin may at any time he chooses obtain a horse which is likewise gifted, but he may never obtain a second within ten years of the first, so if one is killed it is not automatically replaced. The paladin’s horse is a Heavy, with Armor Class 5, Moves 18″, has 5+1 Hit Dice, and high intelligence. Paladins will never be allowed to possess more than four magical items, excluding the armor, shield and up to four weapons they normally use. They will give away all treasure that they win, save that which is necessary to maintain themselves, their men, and a modest castle. Gifts must be to the poor or to charitable or religious institutions, i.e. not to some other character played in the game. A paladin’s stronghold cannot be above 200.000 gold pieces in total cost, and no more than 200 men can be retained to guard it. Paladins normally prefer to dwell with lawful princes or patriarchs, but cir-cumstances may prevent this. They will associate only with lawful characters. It’s interesting how powerful an 8th-level (a mere 120,000 xp) Paladin was – as written they can dispel ‘evil’ spells and undead at will. AD&D tones down these powers quite a bit, tying the former to possession of the Holy Avenger and the latter as just a Cleric’s turn ability. I’ve yet to read this one. Anderson’s Broken Sword is fantastic and I’ve got The High Crusade in my reading pile. Thanks for the recommendation. I’ve read his scifi before, but not his fantasy, so I’m looking forward to this one. Having finished the book – I agree completely. I also noticed a bit of the Dwarf’s underground detection capabilities (when Hugi is navigating the troll tunnels).